One Christmas Day, after placing our turkey to roast in our rented cottage’s oven, we quickly drove the short distance to the raging Atlantic coast. We were on the western edge of the rural coastline near Torrin, on the Isle of Skye, Scotland. We stripped and suited up, then braced ourselves for entering the foaming, coast-battering surf. We swam short lengths parallel to the coast, through breaking waves and fine, salty spray, feeling the raw power of the sea hit us with every new fold of incoming waves. Rain began to fall as we swam, adding a new, stinging dimension to our activity. We returned to shore to face a deluge and no possibility of drying off, so drove back still in wetsuits wrapped in sodden towels, dripping and slightly delirious with laughter. 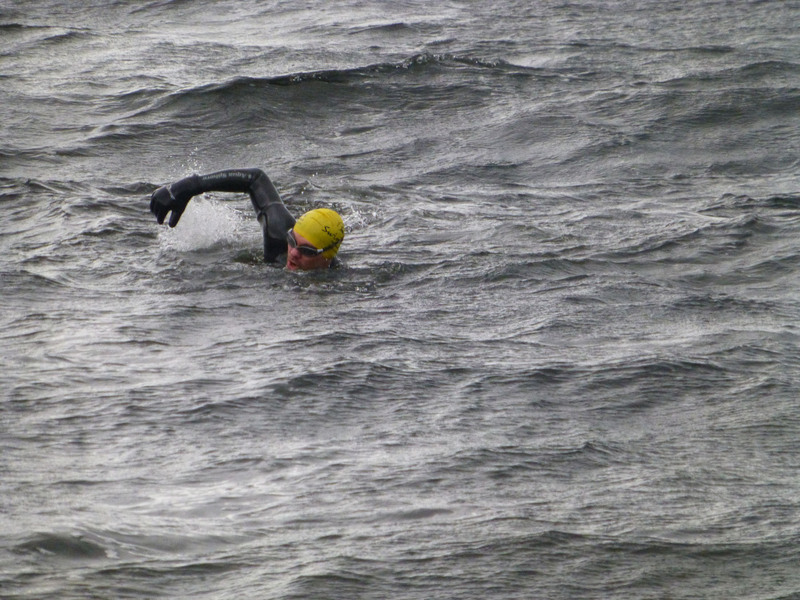 Nothing builds an appetite like a hard swim in a wild sea. With the heat sucked from your very bones you crave the warming caress of excess calories, consumed by the comforting warmth of a log fire. Our afternoon Christmas feast that day was a study in contrast to our bracing, exhilarating morning. 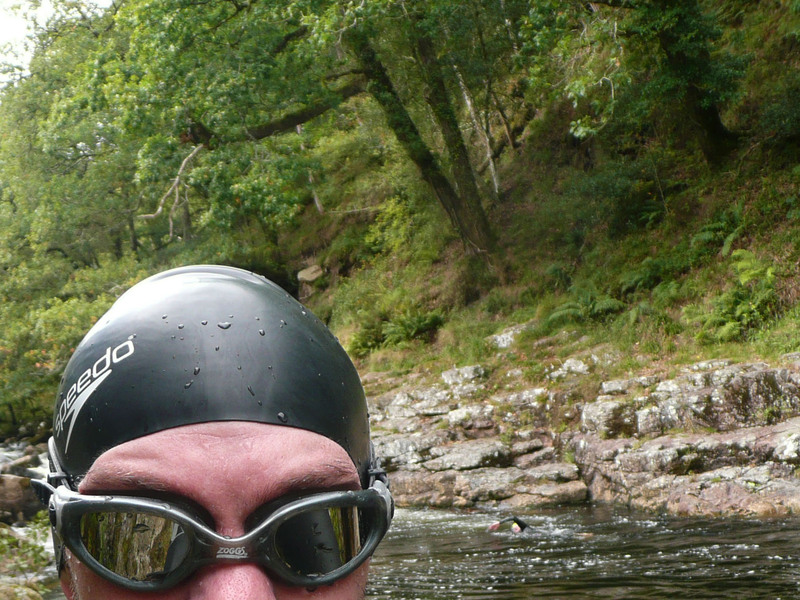 2: Refreshing River Dart dip in Sharrah pool, Dartmoor, England. After a forty minute forest hike loaded with anticipation, we finally arrived at the celebrated Sharrah Pool on the River Dart. 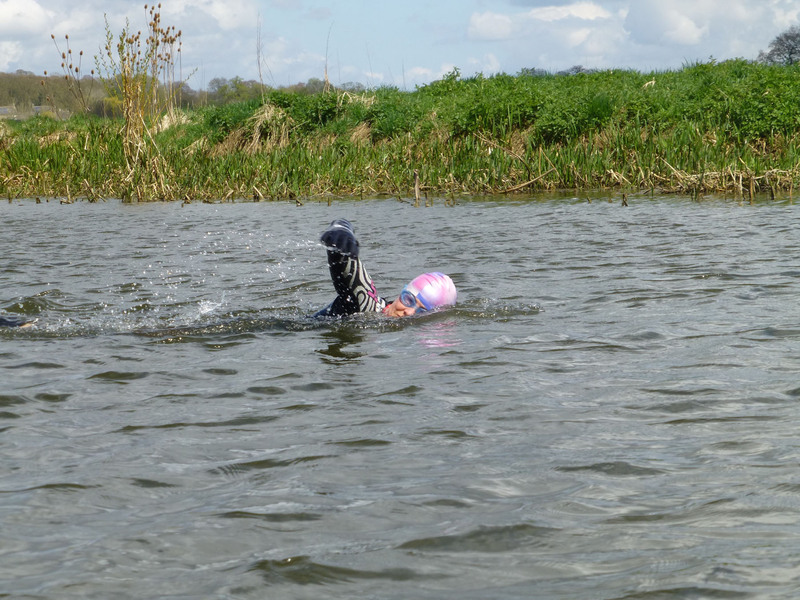 We gladly found ourselves alone and changed into wetsuits quickly, with excitement growing for our cooling dip. 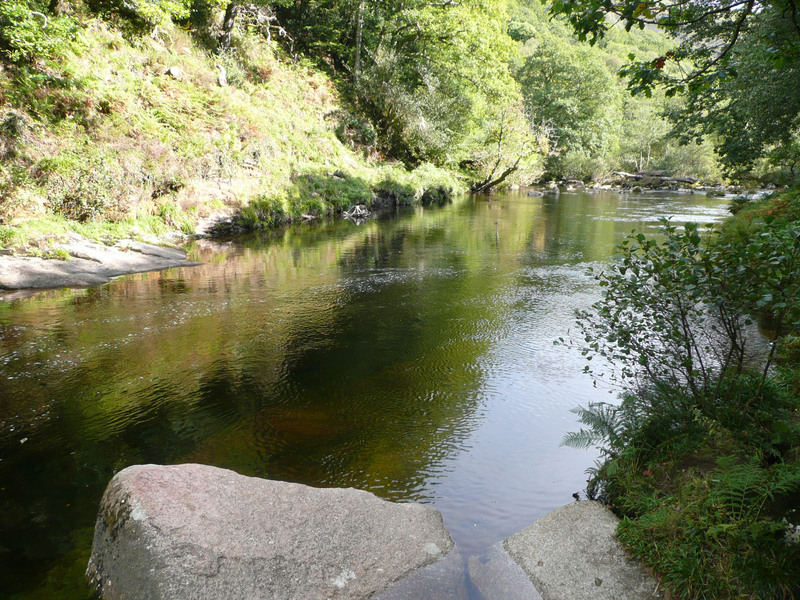 The deep pool is easily 80 metres long and crystal clear, surrounded by thin, bowing trees and dark granite rocks. The fast-flowing river makes a strong entrance at one end of the pool, creating an ‘endless pool’ treadmill useful for longer training sessions. The water soon slows and the central, deepest area of the pool is calmest, allowing for mellow reflection or restful floating. The water enticed us, nymph-like, to remain in its grasp for at least an hour, swimming lengths and playing joyfully, like the free, unburdened children we once were. A few walkers passed us silently, but no other swimmers joined us in the inviting water, and we felt gladly selfish for having the intoxicating experience all to ourselves. 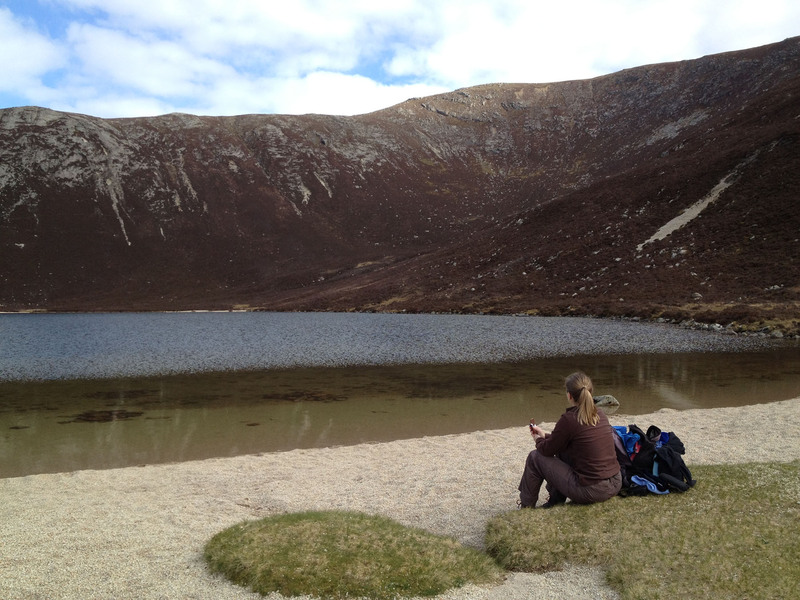 We swam in a small lake hidden in the mountains, surrounded by tall dark cliffs of granite on three sides. This was on the day before our wedding, on a chilly afternoon on the Isle of Arran. Like a required ritual, a physical extension of our vows to-be, taking to the brooding water together became an integral part of the story; our story. 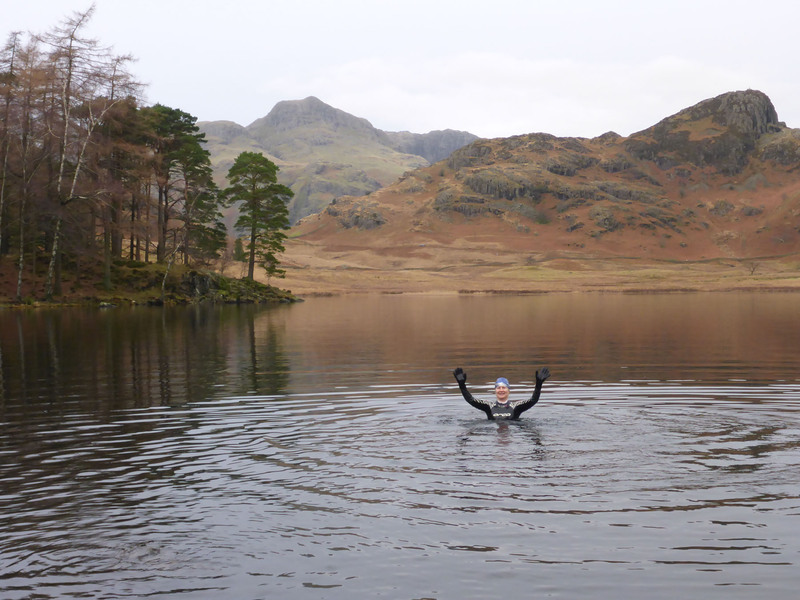 The bracing hike in, the changing into wetsuits, the first tentative dip to the deeply chilly plunge, the tingling relief from the gripping cold on exit; all these actions were complicit in the creation of a personal, meaningful and shared memory for us both. 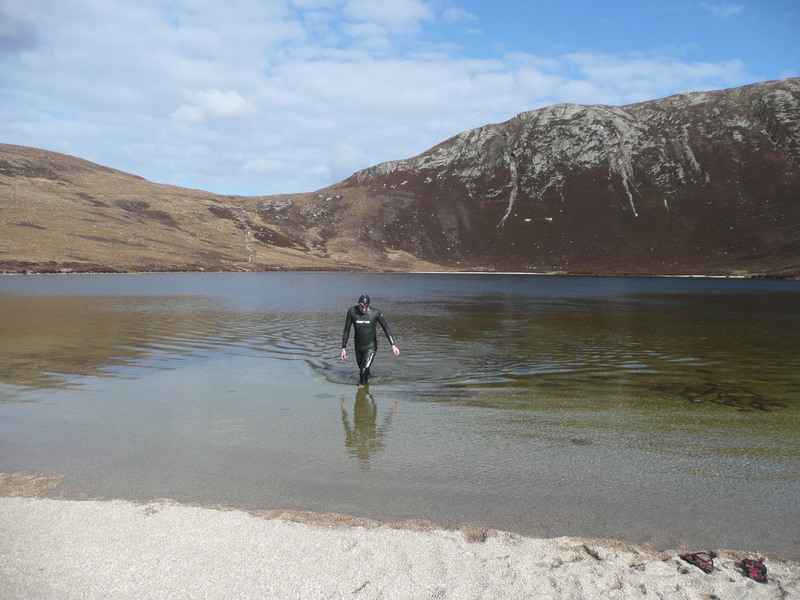 The chilling water temperature precluded any lingering so our swim was bracingly brief, yet the remembrance of the fading sunlight on the dark water and the silent, personal solitude of the remote loch setting will long remain with us, alongside our committed vows. 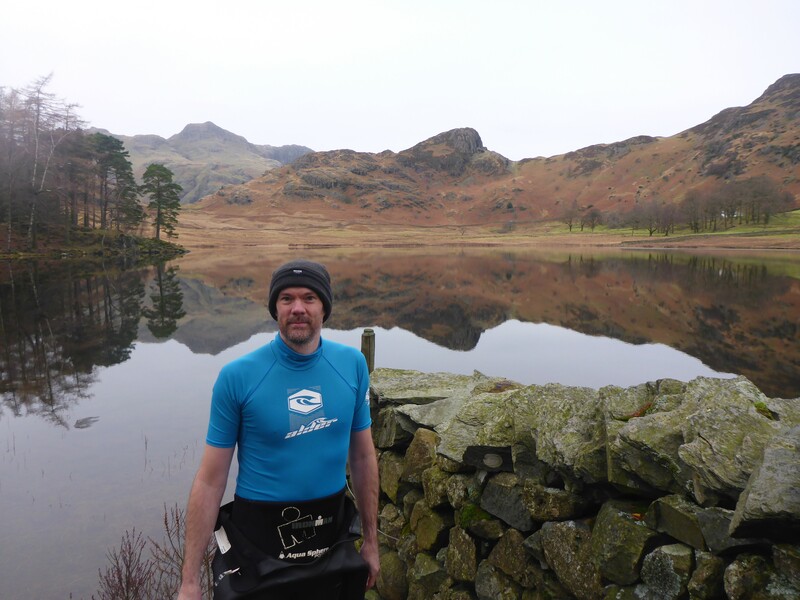 We walked one New Year’s Day to Blea Tarn, in the Lake District, where we changed by a stone wall away from the dog walkers. We slowly, hesitantly, readied ourselves to slip into the reflective darkness. The wetsuits, hats and goggles, once on, transformed us into curiosities, persons of interest, and we were watched by many passing eyes as we made our way to the water. A landscape photographer setting up his tripod nearby was disappointed by our first splashes as we rippled the silky mirror on the tarn and removed the sharp, mountainous reflections. The peaty water would take hours to reform to the same glassy stillness, and we felt a little guilty that our passion had trespassed into that of another. But the view from the centre of the lake revived us and reconfirmed our reasons for being here; to be surrounded by wild beauty and enveloped in the masterful, soft embrace of the haunting black masseur. 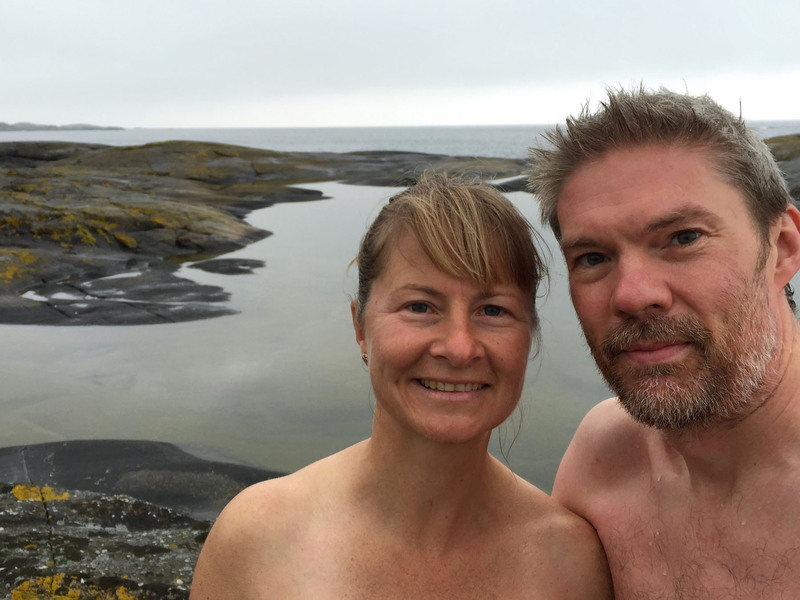 We had three swims in Norway within our first 40 hours after arrival. The first of these was very special and memorable, if only for the contrasting difference from our wet-suited norm. We parked a few miles away, hiked through sparse woodland and skipped over volcanic rocks to find the pothole-strewn coastline of south-eastern Norway, close to Risør. Skinny-dipping in chilly pools doesn’t lead to lengthy swim times, but it creates a sharp shock in memory of the shared, vital experience. We felt freedom from convention as we shed clothes, stood naked on the edge of a deep, unknown pool and slowly progressed in, suppressing the instinct to scream aloud as the water slipped around our goose-bumped skin like a coat of ice. We faced the gripping, tactile sensation of cold water on flesh head-on, exciting nerve endings and chilling blood flow and digits. We kept our heads free and above the surface to avoid deep brain chill as we breast-stroked lengths of the formed pool, breathlessly inhaling and exhaling to repel the deep cold. We left the water and towelled off, shivering and smiling. Walking back, we felt so awake, energised and alive; buzzing, readied for anything; a wonderful introduction to our explorations in Norway. 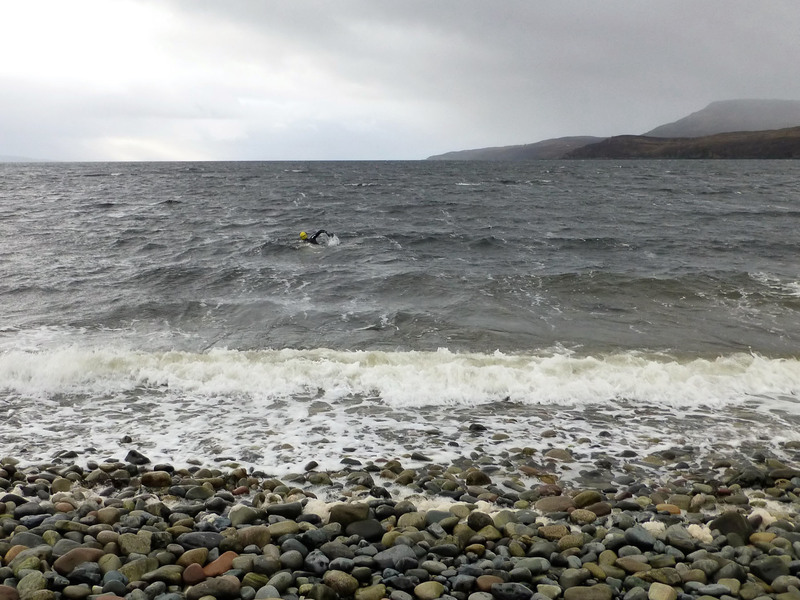 Another memorable New Year’s Day swim, another Scottish island set in bright, turquoise Atlantic waters. 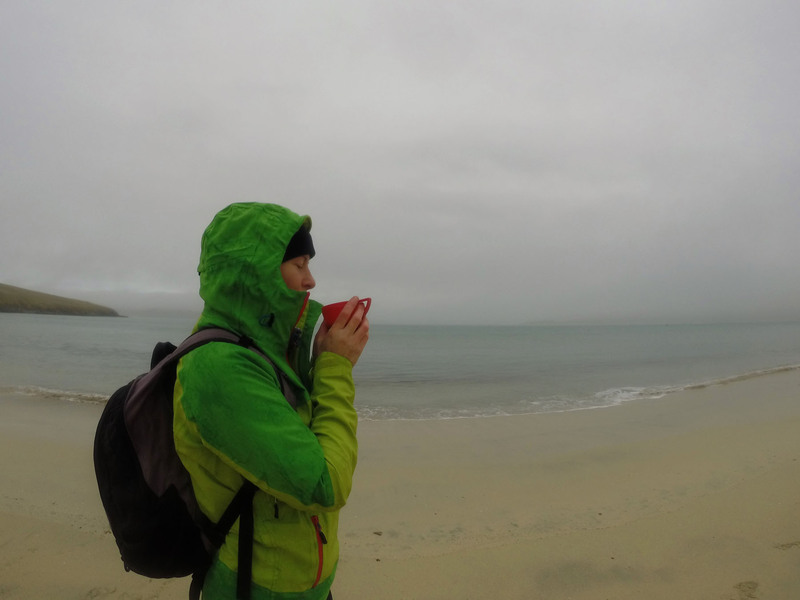 This time we hiked from our cottage to a nearby beach, armed with warming flasks of tea and cake to enjoy after. First we changed out of our hats and winter coats on the empty, misty sand, feeling wary of the chill in the still January air. But the water surprised us, and we surprised ourselves; the Gulf Stream had gifted us a warmed stretch of coast, relatively speaking. We weathered the winter temperatures easily and swam long lengths along the shore, enjoying cutting through the low mist hovering just above the calm surface. The swim lifted us, prepared us mentally for the upcoming year, it acting as a symbol of barriers crossed and obstacles overcame. Afterwards we felt ready for anything, the warming tea back on shore creating a deep bubble of happiness and rising contentment inside; a moment of sublime connection to water, and to each other. 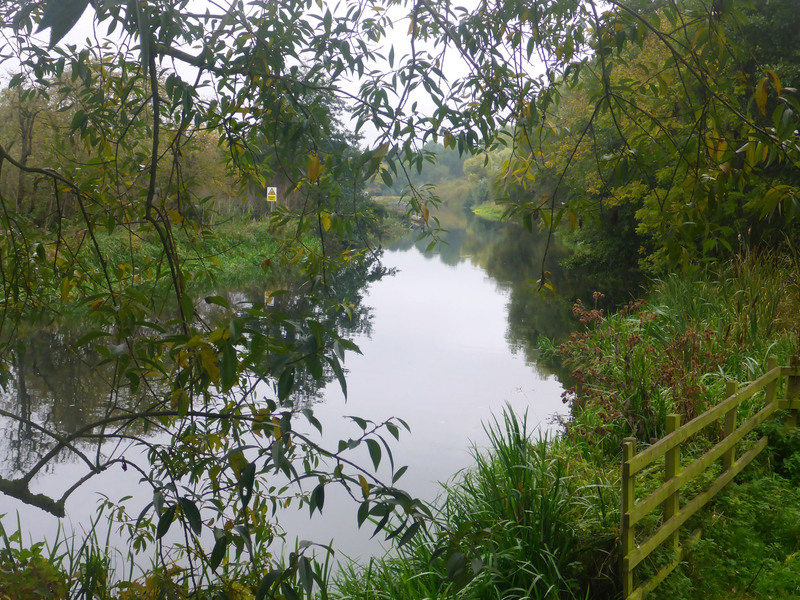 We drove from home to the pretty village of Wadenhoe, one warm, quiet weekend morning. We parked at the King’s Head pub, our usual spot, and prepared to swim. We entered the water and swam right, upstream, in chilly fast-flowing water from the recent rains. We worked hard, a proper training session more than a necessary hit for our swim addiction. We passed curious cows and tickling trees reaching into the water. An hour of graft up-stream later, we thought it best to turn and head home, not quite realising the strength of the rain-fuelled flow we had swam against. We lay on our backs, legs entwined, and floated much quicker than we had swam, reliving the journey with no effort other than holding hugs and smiles of pure joy. We arrived back, suitably rested from our earlier efforts, in less than twenty minutes, delivered like logs on a flume. A workout with a built-in reward; the relaxing, current-assisted float an uplifting delight. This entry was posted in Norway, Other Musings, Swimming on Jun 5, 2017 by Aaron Hill. I think you’ve convinced me to get a wet suit! I’m not a great swimmer but I love to get in any water!